How to get there From the west one takes the SP619 road from Borgo Treponti (739m) or a road from Ponte Nuovo (732m) if you come from the south. The real climbs starts at Laggio di Cadore (943m). The road is steep but usually good. It is less steep from the east – Val Pesarina/Cjanâl Pedarç. The eastern climbs starts gradually as you turn into Val Pesarina from Comeglians/Patossera (522m). From this side you will pass by Forcella Lavardêt (1542m) (250m in on a road where the asphalt ends at the pass and it is not rideable with a road bike from there). 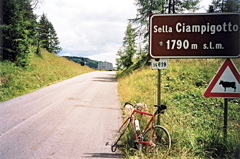 Only 2.6 km from this pass you will find the sign for Sella di Razzo (1758m) (which I always thought was on the road going to Sauris and where it more properly belongs). It is flat from here to the pass. Other comments There is a restaurant at the pass (which was very popular for lunch when I was there in 2000). This is a somewhat lonely pass mostly in the woods on the west side, but has nice parts on both sides. The busy and nice village of Laggio di Cadore, where there are shops, is not marked on the Michelin map, but the nearby almost dead village of Vigo di Cadore is marked on the map. Also see: Sella di Rioda (1801m).